Learn how to freeze fresh herbs in olive oil (or ANY other type of oil you’d normally cook with) to make flavorful little “Herb Bombs”! Works great for basil, parsley, chives, rosemary, oregano, cilantro, and more. WASH + CHOP HERBS: Wash them and shake off the excess water or let them dry for a bit until the water is off them. You can pat them dry with a towel too. This just ensures that there’s less water in with the oil, which when reheated the combo of oil and water will sizzle & pop up in a hot pan. Chop the herbs down to the size you’d like to use later when cooking with these herb cubes. 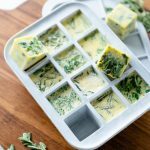 PACK HERBS INTO ICE CUBE MOLDS: Add chopped or whole herbs to ice cube tray molds, be careful not to overfill them so there is room for the oil. I stop at about halfway to two-thirds of the way up the mold. ADD OIL + FREEZE: Cover the herbs in olive oil (or other oil of choice) and fill almost up to the top of the molds. Use a fork or your fingers to press the herbs down and make sure they are covered in the oil to prevent freezer burn. Then put in the freezer and freeze for several hours or until solid. You can pop them out of the molds and store in a plastic bag, glass lidded container, or reusable stasher bag. You can use any herbs and any oil you’d like! See the notes in the blog post above for pointers on how to choose an oil based on what type of cooking you plan to do. HINT: Check the smoke point first! !